Be it a group of friends or a special occasion, a day cruising & lounging or an action packed watersports afternoon. Speed, motor & sailing boats to cater for all your needs. Prices range from 325 to 70,000 Euros a day. Boat size: 6 - 35 m.
Time for a little holiday self-indulgence, right? We can help! 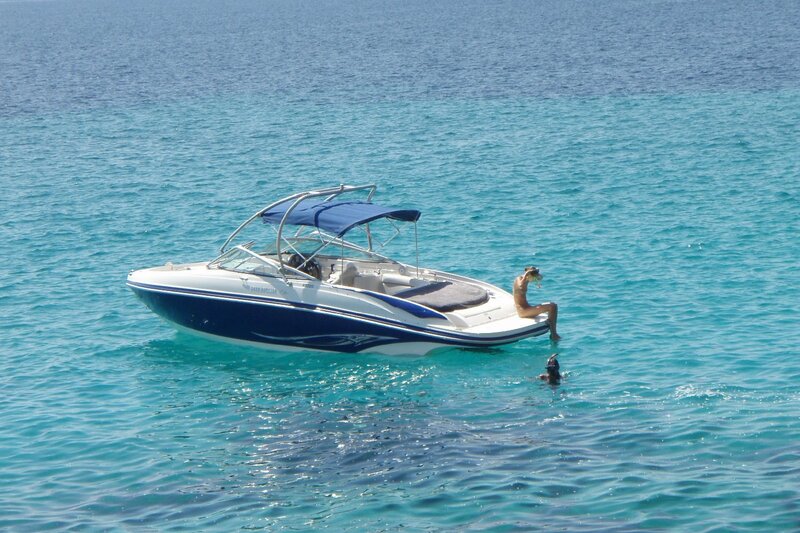 Boats Ibiza is your number 1, trusted resource for boat, yacht and watersports rental in Ibiza. Established 10 years, we love boats, Ibiza and showing you the time of your life! Our expert, qualified staff have explored every inch of that shimmering Balearic coastline and we love nothing more than sharing that beauty with you. From couples to groups of up to 160, we've got you covered. Fancy a super sporty speedboat? A sumptuous yacht with a Funktion One sound-system? We'll get you the perfect package. Our fleet is immaculate and our water toys supercool. We're both boat owners and agents, giving you fantastic choice and flexibility. Best of all, our famous price promise guarantees you the absolute best deal. If you find the same deal cheaper (unlikely!) we'll refund the difference and throw in a bottle of bubbly. Cheers!